The Bobcat 709 is a backhoe attachment manufactured by Bobcat. The 709 is a part of six different current backhoe attachments offered by Bobcat, all of which increase digging depth, visibility and bucket width. All of Bobcat's backhoe attachments, including the 709, are only compatible with Bobcat brand carriers. The Bobcat 709 attaches to backhoes, like the one pictured above. The Bobcat 709 is compatible with the following Bobcat compact truck loaders: T180, T180 RS, T190, T190 (RS), T630 (RS) and T650 (RS). The 709 is not compatible with any of Bobcat's mini-loaders, but is compatible with the following Bobcat skid-steer loaders: S130, S150, S160, S175, S185 and S205. Depending on the carrier that the 709 attachment is connected to, various increases in usability are offered. The maximum dig depth that the Bobcat 709 can manage is 116.6 inches and its maximum reach is 145.3 inches. The pound force rating for the dig force-bucket is 5,042 lbf, while the dig force-dipper is 3,241 lbf. The 709, like all of Bobcat's backhoe attachments, has a swing angle of 180 degrees. In addition to this, the Bobcat 709 includes a standard bolt-on x-change. According to Bobcat, the main use for its backhoe attachments is to give your Bobcat loader quasi-excavator power in a smaller package. 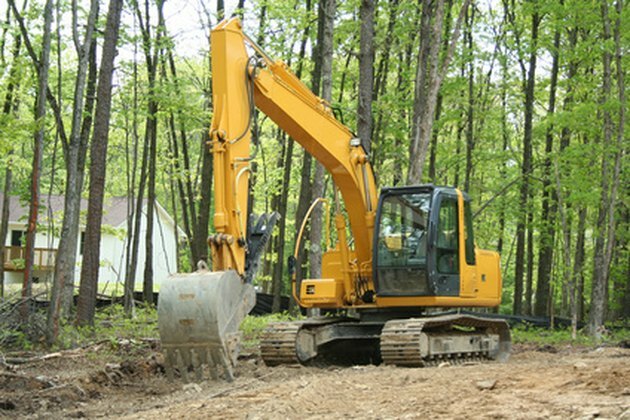 Bobcat goes on to say that its backhoe attachments should be used for landscaping, power line work and other various excavation jobs that couldn't be done with a standard Bobcat loader. Cecil Untega has been a professional freelance writer since 2007. His work includes a multitude of articles written for various Delaware publications including Delaware Online and the "Newark Post." He holds an Associate of Arts degree from Delaware Technical College.